Leveraging our expertise in stem cell biology to explore new therapeutic areas, AIVITA has developed a skin care technology which aims to recreate the microenvironment responsible for the growth and maintenance of human skin. Comprised of components which support early skin development, the technology represents a novel and promising approach in the pursuit of younger, healthier looking skin. Nistor G, Poole AJ, Draelos Z, Lupo M, Tzikas T, Liu JH, Keirstead HS. 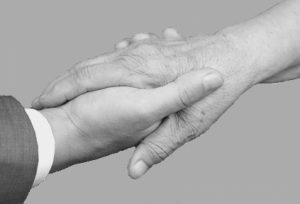 Clinically, skin aging can be categorized into intrinsic and extrinsic aging. Intrinsic aging is a natural biological process that leads to thinning skin, the development of fine wrinkles, and the deepening of facial expression lines. Extrinsic aging accentuates intrinsic aging in the form of blemished, thickened, yellowed, lax, and rough skin. 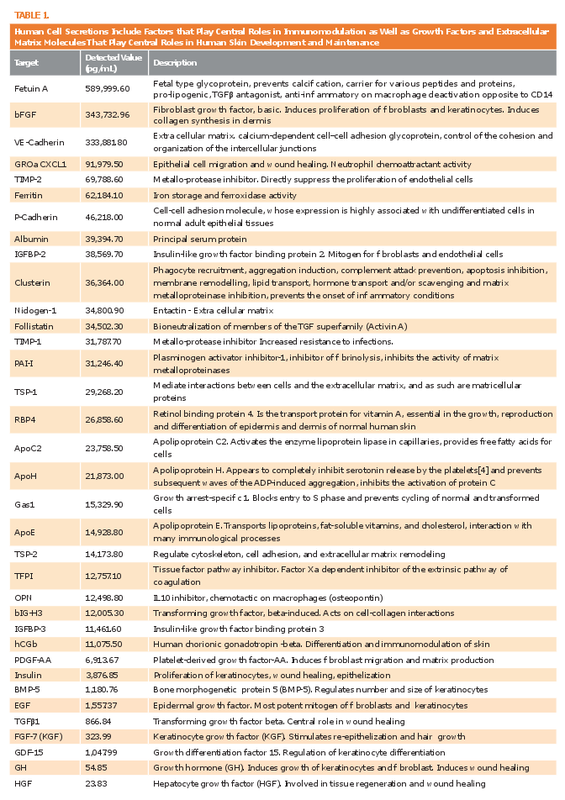 Botanical derived growth factors differ from mammalian factors and cannot precisely fulfill the same functions, including cell-cell interactions, energy metabolism, genetic modulation, post-translational modification, and waste removal. Botanical factors can cause irritation and allergies within mammalian systems due to their antigenic properties, botanical-derived products often rely on the use of toxic solvents for purification. Cell sources which have been screened for infectious agents produce factors which do not present the toxic risk that botanical extracts do. Many current cosmetic products based on cell lysates or extracts generated in high density bioreactors produce a foul odor as a result of degraded proteins. In contrast, supernatant from growing stem cell and stem cell derivate culture is composed of media containing vitamins, amino-acids, nutrients, as well as the unaltered secretions of live cells. The complexity of the factors secreted by a cell population in a very early developmental stage mirrors the developmental milieu of very young organisms. 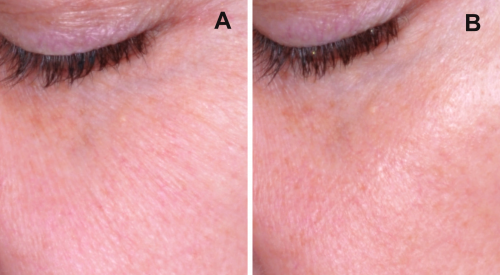 Figure 1: Improvements in overall appearance were observed starting at week 2, with improvements in overall appearance being evaluated at 40-50% in all groups by week 12.1 Figure 2: Improvements in individual signs of aging were recorded and tracked over the 12 week period. reflects a statistical trend of increased labeling in treated tissue (C). Figure 6: Subject photo. (A) Baseline, (B) 12 weeks after application of test material. Figure 7: Subject photo. (A) Baseline, (B) 12 weeks after application of test material. Farage MA, Miller KW, Elsner P, Maibach HI. Intrinsic and extrinsic factors in skin ageing: a review. Int J Cosmet Sci. 2008 Apr; 30(2):87-95. 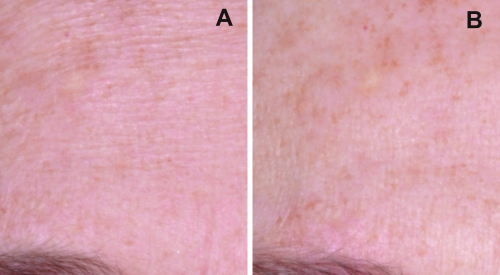 Gilchrest BA: Overview of skin aging. J Cut Aging & Cos Derm. 1998; 1(1):1-2. Klingman AM, Klingman LH: Photoaging. In: Fitzpatick TB, Eisen AZ, Wolff K, Freedberg IM, Austen KF (eds. ): Dermatology in General Medicine, Vol. II. New York, NY: McGraw-Hill. 1993; 2972-2970. Kim JH, Jung M, Kim HS, et al. 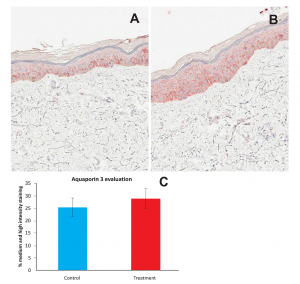 Adipose-derived stem cells as a new thera­peutic modality for ageing skin. Exp Dermatol. 2011; 20(5):383-387. Lin CS, Xin ZC, Deng CH, et al. Defining adipose tissue-derived stem cells in tissue and in culture. Histol Histopathol. 2010; 25(6):807-815. Yun UW, Yan Z, Amir R, et al. Plant natural products: history, limitations and the potential of cambial meristematic cells. Biotechnol Genet Eng Rev. 2012; 28:47-59. Simpson EL, Law SV, Storrs FJ. Prevalence of botanical extract allergy in patients with contact dermatitis. Dermatitis. 2004 Jun; 15(2):67-72. Antignac E, Nohynek GJ, Re T, Clouzeau J, Toutain H. Safety of botanical ingredients in personal care products/cosmetics. Food Chem Toxicol. 2011 Feb; 49(2):324-41. Garber AJ. Biosimilar products are not bioidentical. J Diabetes. 2015 Mar; 7(2):153-4.